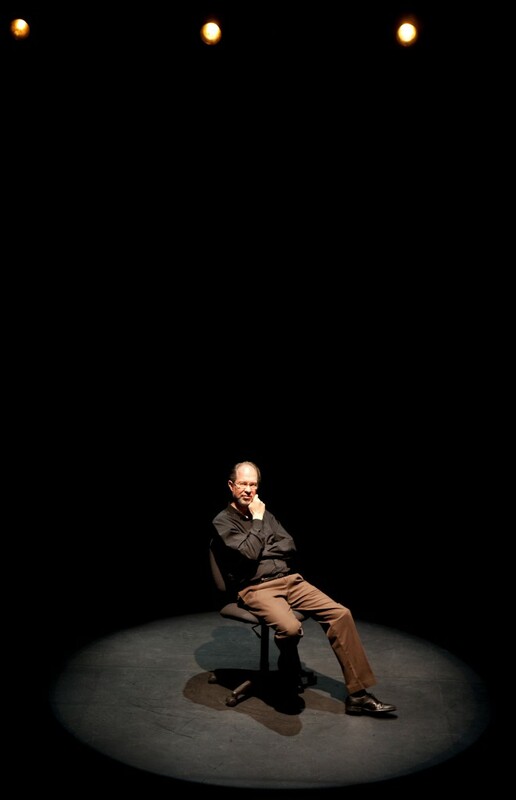 At the beginning of Soulpepper Theatre Company’s production of The Aleph, playing at the Young Centre for the Performing Arts, the house lights were left on to illuminate a “set” that consisted of just a single swivel chair and a large closed curtain. A man entered the room, whom I knew to be the star of the play, Diego Matamoros, and started telling what I thought was an anecdote about his experience as an actor. Diego never approached the stage, but instead, stood in the rafters talking while he handed out a picture of himself taken 30 years ago. I was impatiently waiting for him to stop wasting my time telling me what I thought was a personal story and to start the play already. It turns out he had, and relating this anecdote was actually the beginning of the play. If you think that making the audience actually forget that they are watching a play is an accomplishment, then The Aleph was certainly successful in this respect. Reality and fiction were blurred, in the beginning at least. My issue was I felt that it was ultimately a play without the play. The whole thing just features Diego Matamoros sitting in a swivel chair delivering a monologue. The Aleph self-reflectively addresses my criticism when Diego describes a play-within-a-play where he criticizes the director for just having “an actor sitting in a chair”. I like this playful way of mocking my criticism, which the writers clearly anticipated. Regardless, I stand by my criticism. So while I really hate to admit that I may in any way be a philistine, I suppose that’s what I am. This play was just too avant-garde for me. I’ve read that critics attacked Samuel Beckett’s Waiting for Godot on its opening with criticisms like: “Nothing happens”, and while I love Beckett, I would have to say the same thing about The Aleph. To be fair, though, the writing in The Aleph is very good and quite intelligent. I especially liked the references to writers like Sartre, Ovid and Mallarme. However, I felt the play was so minimalist that it ceased to be a play. What I mean is that when you remove the sets, costumes, props, different actors and even movement from a play, you don’t have much left. It’s like using the medium of film to create something that could be made using the radio. I really do appreciate director Daniel Brooks’ and Deigo’s attempt to reduce theatre to the bare essentials, but perhaps there’s a reason why other plays have those essentials, like movement. The most interesting part of the play are the mirrors placed behind the curtains so that audience members can see each other and Matamoros simultaneously. I thought this was a brilliant idea full of symbolism, and my mother Angela, who came with me, also really liked the use of mirrors. If you’re wondering, an “aleph” is the first letter of the Hebrew alphabet, and in math, an aleph number is a way of measuring types of infinities. In The Aleph, based on the short story of the same name by Jorge Luis Borges, a man finds a single point, called an aleph, where everything in the universe can be seen from all angles simultaneously and still be completely understood. The mirrors themselves create a sort of real aleph in that they allow any member of the audience to see both the play and all other members of the audience at the same time, from a single point (i.e. any seat in the theatre). If you can get over the fact that the play is just one person sitting in a chair telling you a story, you would probably enjoy The Aleph a lot more than I did. And while I don’t think it was a wholly successful experiment, I still think it may be worth watching. I also felt that The Aleph’s experimentation was very much in the spirit of Jorge Luis Borges, whose radically different approach to storytelling revolutionized the short story in the same way that The Aleph tries to revolutionize theatre. Unfortunately, The Aleph ended its run on Saturday March 20. It was a ‘Lab Series’, so it might at some point return to TO. In the meantime, Soulpepper Theatre Company (located in Toronto’s historic distillery district), has a number of other productions planned for 2010. I’m personally looking forward to the remount of David Mamet‘s Glengarry Glen Ross, and Russian master Ivan Turgenev‘s A Month in the Country.